See the local sights from above. 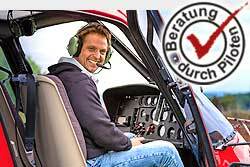 Enjoy a helicopter flight at the Ruhr Area. The route will be discussed directly with the pilot and depends on the wishes of the passengers, the weather and of course the flight safety. Flight if possible to the local attractions. When do you make a helicopter ride from Aachen-Merzbrück?